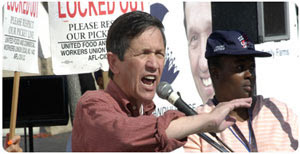 Why should someone like Dennis Kucinich (D-Ohio) be selected as the next leader of the Democrat minority in the House? Because Democrats might as well earn the characterizations that the Dems are presenting policies that are from the far left of American politics. Perhaps a few years of seeing an actual progressive politician in charge will remind America that killing the public option for the Affordable Care Act was not the result of some vast socialist conspiracy. Watering down the financial regulations at the behest of the banks was not part of some radical liberal strategy. And yet both the Dodd/Frank Act and the Affordable Care Act were made out to be the result of the Democrats in Congress forcing through a supremely leftist agenda. So if they're going to do that when the policies are already center-right to begin with, what more can they say? If there's one thing I wish that the Democrats would learn from their Republican colleagues it would be that there's no inherent problem with advocating policies that are far from the middle, so long as you do a good job of making your opponent's most moderate proposals seem extreme, and you phrase your own arguments so that people can identify some familiar aspects of your policy. We've seen this with the Sarah Palins, Jim DeMints, and Rand Pauls who advocate very right wing policies yet attack anyone who opposes them as some far left wing nut. Having a true progressive at the reins for a few years will remind people that they really are in favor of the so called "socialism" in America; from social security to Medicare, Americans like their government programs. Somehow the Democrats' messaging in the past couple of years was so weak that they allowed the GOP to take up the mantle of defending Medicare against spending cuts. So now that Pelosi has to hand in her gavel, maybe it's time to take a real progressive activist, who almost voted against the Affordable Care Act because he recognized it was far too big of a gift to the insurance companies and not focused enough on providing quality care to Americans, a chance to lead his party and remind America about the differences between what the GOP offers and what the Democrats can offer. Maybe if the public could see what real liberal policies were, they wouldn't be so quick to accept Karl Rove's and Sean Hannity's instant labeling of so many moderates as extreme leftists.